August 28th, Irene strolled by Boston. Not bad as storms go. 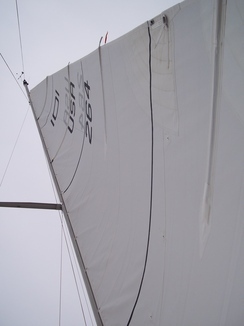 Averisera was prepared by having the mainsail stowed below and the canvass dodger removed. Scenes from the hurricane Irene preparations. 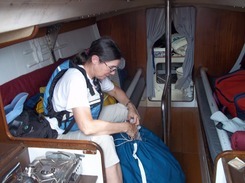 We doubled up on the mooring gear for Averisera. 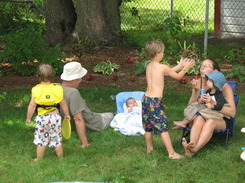 Afterwards, grandsons, Luke and Marc played in the Park. 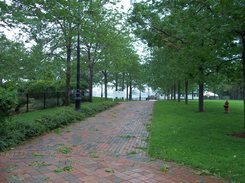 The view of path and trees is during the storm. The Park is gated and was locked on Sunday the 28th. Norm could not go for a closer look. 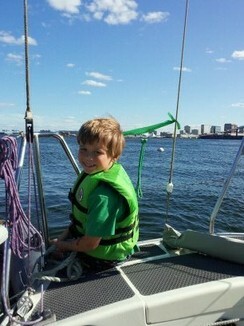 Piers Park Sailing Center has a Mini 2.4 which the sailing instructors love to sail. Maybe the coolest boat toy ever devised. We had some guests yesterday. 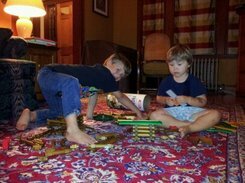 It was nice to let the kids visit with each other. With wet hands, Luke was able to catch a bubble and stretch it! Pretty neat. Marina seemed interested in the boys antics. Random adventures at Piers Park and at Wright's Pond. 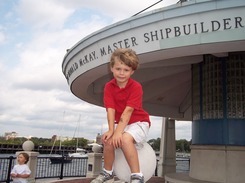 A visit to the USS Constitution is planned. 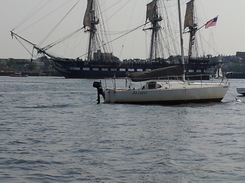 Here, she is seen during a recent training exercise on Boston's Inner Harbor. AVERISERA finished fourth in our eleven boat class and fifth in the 50-boat fleet. Twenty eight boats started ahead of us. 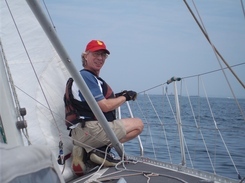 At about one third of the race, we rounded the green blinker off Graves as twelfth in fleet. At that point, we were the second boat in our class. The J30, Ruffian was ahead of Averisera. 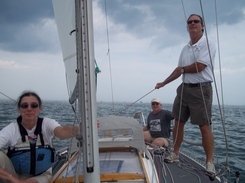 The crew, Elizabeth, Norman, Tom Brown and Vasiliy Gusev concentrated on attacking the boats in our class ahead and defending against approaching class boats. There was no defence against the Elliot 770, Rockit, and the Melges 24, Rolling Stone. 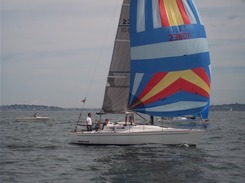 Static, an Evelyn 32, showed us a new trick for playing the current relief off Deer Island and slid past us to finish third in our class. Much of our time was spent dealing with a J29 MHOB and a J30. The J29 rates 111. The J30 rates 150. Averisera comes in with a PHRF value of 135. Getting past the J30 wasn't as hard as defending against the J29. Thanks for the kite trimming abilities of Vasiliy, we kept our boat moving. Rockit in the blue kite, Apeiron in pink, the fleet astern. 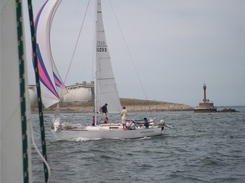 We are competing for the Mass Bay Pursuit Cup. Ten points for entering, a point for each boat in the class we finish ahead of. Must race four of the six events to qualify. Three more pursuit races this year. Two of those events have big fleets but the classes are usually set at about a dozen boats. We'll see. This is our first run at the trophy. 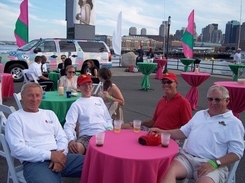 Norm and Vasiliy work for Boston Sailing Center. 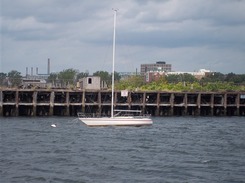 Averisera is moored at Piers Park Sailing. 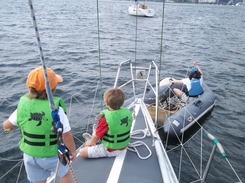 We all gather at Courageous Sailing. 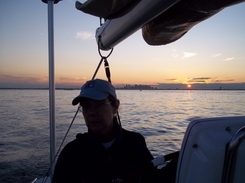 It is a friendly sailing community in Boston Harbor. 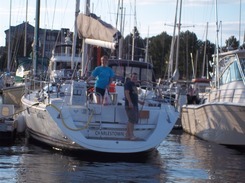 Cottage Park YC sponsors a fund raising regatta for the Make A Wish Foundation. 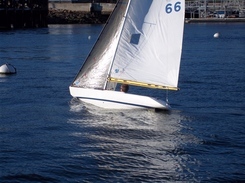 Averisera participated and finished first in fleet. The finish is, of course, satisfying. More satisfying is that the day was just the best day of sailing we had had in a long time. 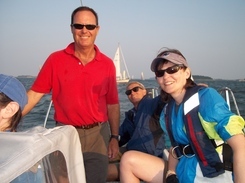 The crew of John, Tom, Elizabeth and Norm got the boat going fast in the right direction and sailed a no-major-mistakes race. There were eighteen boats in two divisions, spinnaker and non-spinnaker. The fleet started near yellow nun E at the eat end of the Small Boat Channel, raced out to the green blinker off Graves Light and back. Light air nearly delayed the start. 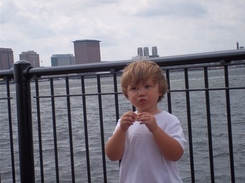 The breeze filled in at about three o'clock, building to about 15 knots from the SW. Remarkably, we carried the kite for the first four of the six mile first leg and four of the first six miles of the second leg. Usually, we sail upwind in both directions around here. Images of the crew, the way, way astern fleet, and the Tartan Ten, Tachy, a sloop similar in many ways to the Aphrodite 101. 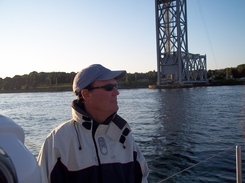 Constitution YC approached the two yacht clubs in Winthrop about a joint Wednesday evening race in "their" waters, President Roads. After much discussion about how to combine the two fleets a date was set and a race held. It was billed as a "Rumble" between city kids and suburb kids. Ha ha. The wind came in at about 15 knots with gusts in the low 20s. Big wind for our boats and sailors. 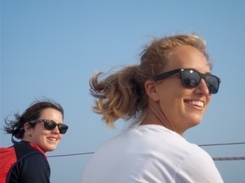 Normally, we race in winds under ten knots.Averisera was rigged with her new main reefed once and the 77% headsail. 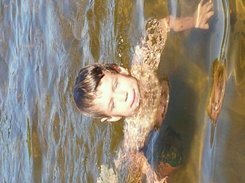 We were fast in the puffs and slow in the lulls. The headsail was switched up tot he 107% and the reef shaken after the first leg. We were faster in the lulls and a bit slower in the puffs. 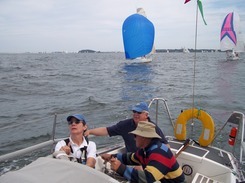 Lesson learned, if the breeze is trending up, stay with small sails. Seems obvious but we got a chance to calibrate the difference against other boats. 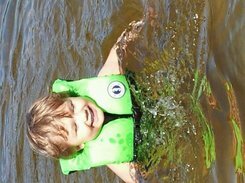 A camera malfunction resulted in many missed opportunities. Following are some pictures of the crew: Elizabeth, Norm, Vassily, Gladie, John, Lila and Alex. 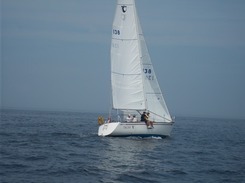 Elizabeth and Norman delivered Criag Speck's Alerion 38, VIGOR, from Boston to Falmouth at the end of July. Craig, a Constitution YC memeber, needed to get the boat toa regatta venue at the same time other pressing matters prevailed. 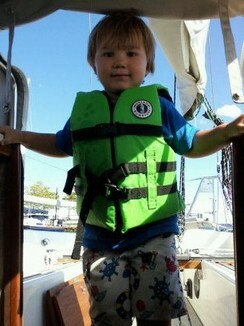 E+N moved the boat. 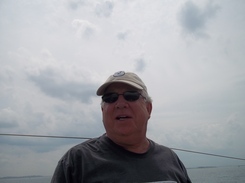 We made a pleasant night passage from Boston Harbor through the Cape Cod Canal into Buzzards Bay and finally to Kingman Marine in Falmouth's Red Brook Harbor. The entire trip was about 12 hours. 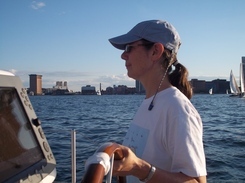 We motored the entire way in flat calm or nearly flat calm. Autopilots are grand! 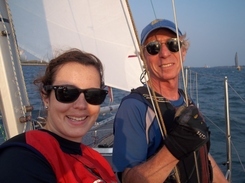 On the way out of the marina, we spoke with Herve and Sarah on JESSICA, their new Jeanneau 44. 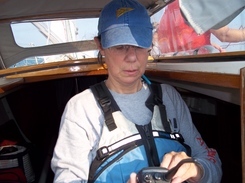 Norma had H+S aboard the Jeanneau 44, Ti Zeff, during a Caribbean training cruise. 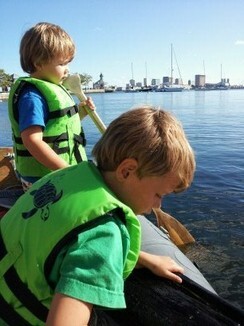 They were, of course, working on the boat. (Why else would one have a boat?) Recent note from them indicate that some good cruising has been done, too. A few pictures to demonstrate the "drama" of motoring along peacefully in a calm.